Mother’s Day is getting near and maybe you’re looking for a fun gift idea for grandma, mom, or even a friend…and one that doesn’t break the bank is even better!! I picked up a simple tote bag in the Target dollar section the other day for $3 and decided to turn it into a personalized tote for Mother’s Day. Personally, as a mom, I love gifts that have my children’s hand or footprints on them…we all know how fast those little hands and feet grow, so why not mark it for a lifetime on a handmade keepsake? 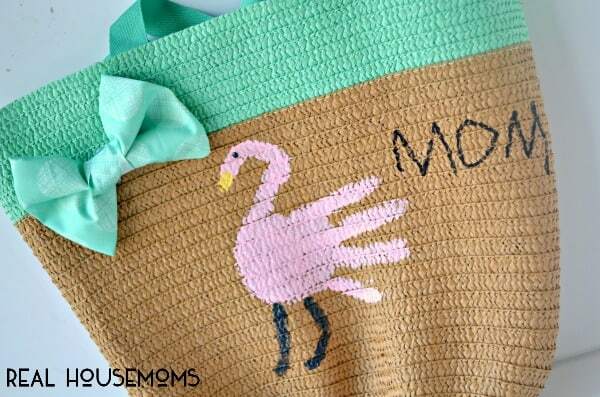 Today I’ll show you a SUPER simple Flamingo Handprint Mother’s Day Tote Bag idea that anyone can make for a little money and no time at all! 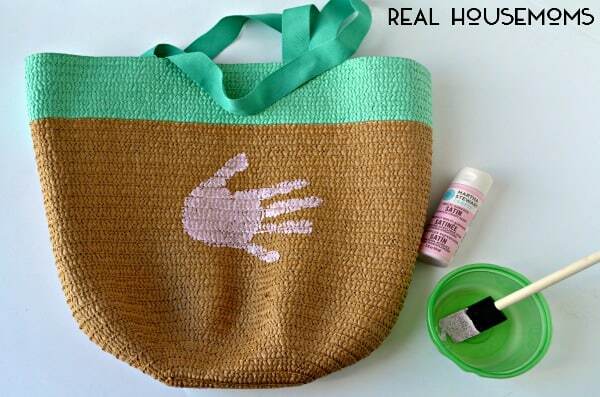 Basically you start with your child’s right hand painted with pink paint…when you press the hand down, be sure that they keep it very still and the position of the hand should have the thumb UP so that you can turn the thumb into the flamingo’s neck. After you get the handprint, then you work on developing your flamingo. from the edge of the thumb you draw a U to create the neck and then draw a little yellow beak on the end and a black dot for the eye. 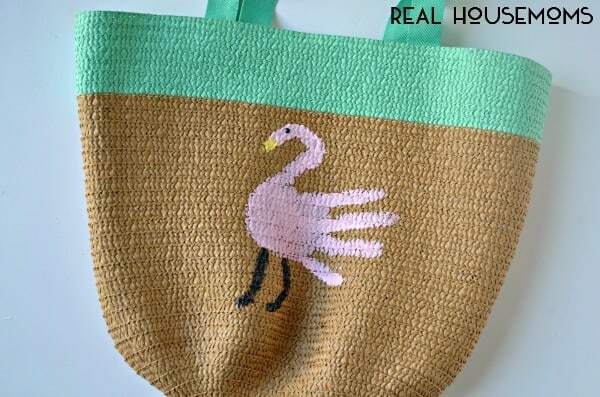 You then use your black paint and draw legs on the flamingo to finish it off! I go back over the handprint and fill in any gaps with paint too. 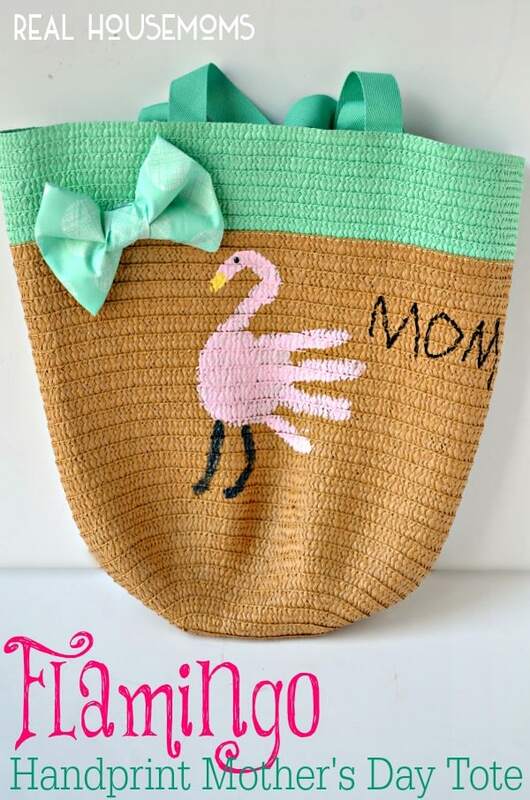 Once it’s done, I let my son write “MOM” on the bag with black permanent marker and I added a simple bow to the top with hot glue. I think it turned out so fun and it’s going to be my lunch bag for work now! This is a very smart idea and I liked that you let him write on your bag at the end- it was quite the finishing touch. My wife and daughter really love arts and crafts like this, so maybe if they are up to it, we can give it a try. I’ll try to pick up the bag at Target this weekend. Thanks Abbey!